When we last spoke, I was becoming curious about the workings of My Creative Block, hoping to at least ease the resistance and struggle, daring to think it could even be perverse fun. You don’t have to read that piece to understand this one, but it might illuminate. Anyhow, it was curiosity that led me to pick apart the components of the Creative Process to see if and how Blocks fit in. That’s what I’m gonna talk about here. I needed to know. Was I sidelined? Burnt out? Washed up? Or could this achingly exhausting pause be re-framed as predictably normal in the larger scheme of things? I eventually saw that it wasn’t a deadend Creative Block at all, rather, it was its own unique creative project with a recognizable flow. 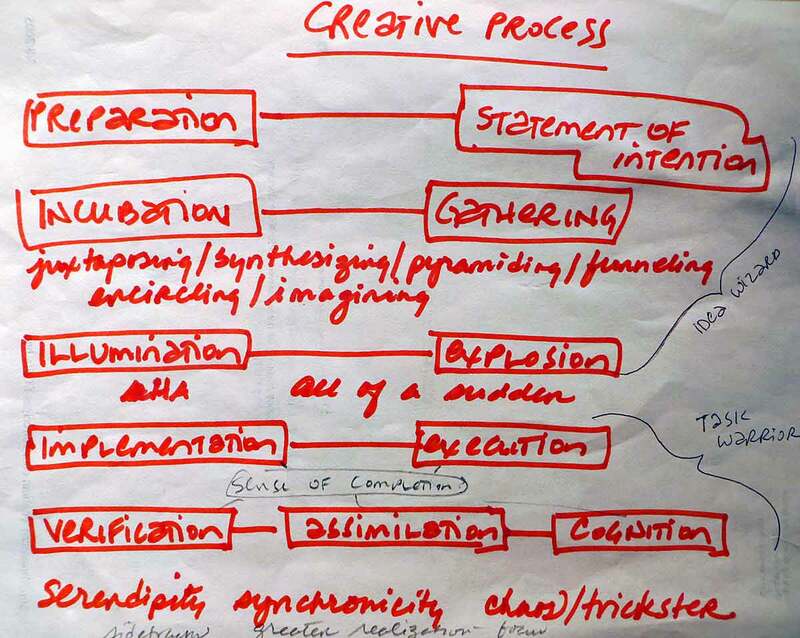 Up top is the Creative Process Chart I keep handy in my studio. It’s a mash-up from several wise teachers and thinkers which I have annotated over time. If my Block was ultimately another creative endeavor, where was I in the process and how could I expect it to go? BINGO! Those were the right questions. Now we’re cookin’ up some shrimp ‘n’ grits! With the CP Chart in hand, I determined the Block was basically an extended version of INCUBATION/ GATHERING and, because of its endurance, was very likely an important watershed. A sea-change, even. Contrary to my guilty sensations of failing, shirking and helpless procrastination, my highest and best endeavor right now was to NOT be in my studio cranking out soulless crap just because I thought I should be. Ahhhh! My challenge then became to see how long I could stay out of the studio! Instead, I needed to stay open to all else that came up in every other location and activity that filled my days. I tell you, with just that simple of a revelation, all things creative, block and all, began to feel refreshed, honest and in perfect alignment. I relaxed into the stillness. What am I drawn to do with clay now? How can I combine the Calligraphy and Lettering I am learning with ceramic techniques? How do I feel when I go in my studio now? I also took comfort in connecting the serendipities of what came across my screens, my mails, music playing anywhere, conversations held and overheard, as well as what came off my bookshelves and out of storage files. Reading and conversations are always important to me, but sometimes the casual coincidences were uncanny. Here are a few I want to mention and thank. Thank you Martha Beck for “Give it a Rest,” which explains the value of intentional resting. Thank you Brené Brown for “Rising Strong” which hacks paralyzing fear to teensy bits with science and loving humor. Thank you Andy Puddicombe for your deeply charming meditation app Headspace, my daily 15 minutes of salvation which manages to creep into everything else. And Thank You to Haruki Murakami for your completely other-worldly novel, “The Wind-Up Bird Chronicle,” which churned up my looping brain and sent it into other dimensions and perceptions. Thank you Saratoga Rotary Art Show jurors for accepting me into a show I was resigned to be rejected from as further proof I needed to lay low. Instead, I am getting ready to represent in living color in my hometown! Thank you America’s Clay Fest IV and jurors Sergei Isupov and Leslie Ferrin for accepting a piece of mine into this premier international exhibit, a longtime-someday goal of mine. At around 10-13% acceptance rate, it was in the spirit of “freedom’s just another word for nothin’ left to lose” and daring greatly that I clicked the send button on the entry. Glad I was curious enough. –Liz Crain, who is the first to admit that if, last January, she had found the resources she talks of here – all wrapped-up and neatly presented, they likely wouldn’t have impacted her or her Block at all. That’s because the Gathering/Incubation time needs to HAPPEN. To percolate and to occur organically over time. The curiosity, the seeking, the attending, the heightened connections, the daily living matters far, far more than having the answers. It’s life-changing to have the right questions to begin with, but “intentionally resting” and letting the answers and their truths arise of their own accord is key. Next post: Handle With Care. Uh, Not Like That.